Zuka – Clean, Minimal eCommerce Bootstrap 4 Template is a splendid design of HTML template. Zuka is ready to be the online shop for selling Men Fashion, Women Fashion, Shoes, Furniture, Home Décor, Sunglasses, RMG Products, and Leather Goods etc. Zuka is a complete and ready to use template having 45+ HTML pages including 10 Unique Homepages, 7+ Header Layouts, 6+ Shop Layouts and 8 Product Details pages. However, Zuka is built with Bootstrap 4, HTML5 and CSS3. It has Pixel Perfect Design, Clean Markup, Responsive Layout and Cross-Browser support that are the demands of the time in website development. 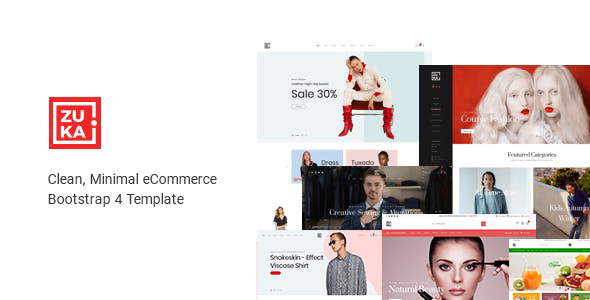 Moreover, this eCommerce Bootstrap 4 template brings Faster Page Loading, Amazing Mega Menu, Google Font, Smooth Animation, Well Documentation and most importantly no Console Error. Not to forget, Zuka – Clean, Minimal eCommerce Bootstrap 4 Template provides easy-customization process and free updates for the users. Install it now and grab the opportunity.